WATERLOO – Alumni, community members and students will gather in Waterloo Sept. 22 to 25 for Wilfrid Laurier University’s annual Homecoming. Close to 10,000 people are expected to attend the “stay golden” themed celebration. 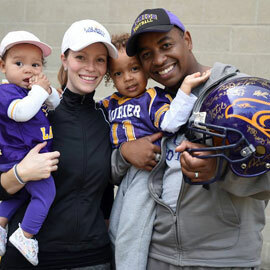 Glen Wimbush graduated from Laurier’s Bachelor of Business Administration program in 1986. He keeps in regular touch with a group of friends from Laurier, but Homecoming is a chance to reconnect and reminisce with other alumni from his class. “We became a really close-knit group as students, and we’ve made a point of coming back to campus for Homecoming every five years,” he said. This year, he and his classmates will celebrate their 30th reunion. Festivities begin on Thursday, Sept. 22 and run throughout the weekend. Members of the community are invited to attend many of the events, including the free pancake breakfast on Saturday morning, followed by the football game on Saturday afternoon where the Laurier Golden Hawks will take on the University of Waterloo Warriors. Alumni like Wimbush will have numerous opportunities to catch up with fellow grads through reunion dinners, two alumni celebrations on Saturday night and exclusive access to the stadium end zone during the football game. In addition to the alumni who are celebrating reunions, several faculties are commemorating special anniversaries with lectures, tours and alumni awards. The Lyle S. Hallman Faculty of Social Work, the Lazaridis School of Business & Economics and the Department of Political Science are all marking 50 years. The celebrations in Waterloo mark just the beginning of Laurier’s Homecoming. The university’s Brantford campus will celebrate Homecoming Saturday, Oct. 22. Find registration and detailed information about Homecoming events.